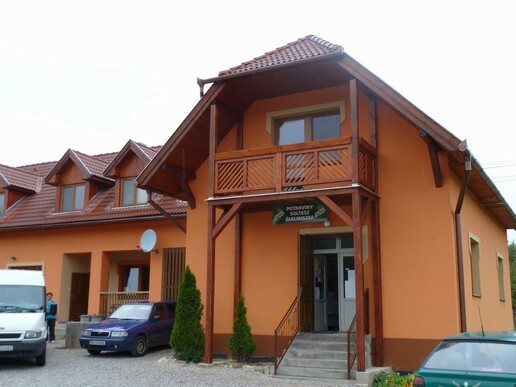 The accommodation facility is located in village Krasnohorska Dlhá Lúka just 5 km from regional town Rožňava. Accommodation is in the garret of building with shop on ground floor. Separated entrance is from court throw terrace. We offer 3 two bed rooms and 1 bed room with additional sofa for use. Two bed rooms can in case of interest equipped with extra bed. Floor has two bath rooms with shower cabin and toilet. Common dayroom has kitchen corner with stove, microwave oven, fridge and dishes. For your pleasure in garden is shelter with barbeque and swing for children. Public transportation is via train just 1,5 km away, bus connection to Kosice just 3 km from village or local bus transport from village. Nature around village is giving great possibilities for hiking and cycling. Near is a walking trail to Silická plateau. Village is very close, 6 km from Krásnohorské Podhradie, where you can visit castle Krásna Hôrka and Františka Andráši Mausoleum. Castle Betliar, Andraši family residence, is also very close only 10 km. Directly in village you can visit unique Krásnohorská cave with the highest stalactite in Mid Europe. Possibilities are to go by car or bicycle to Bôrka valey with clear air and a unique flora and fauna. On a way to Košice there are Turňa castle and Jasovská cave. Who love caves there are Gombasecká cave, around 20 km away and Domica cave, Dobšinská Ice cave or Ochtinská aragonite cave up to 50 km. For 3 and more nights we are giving 10% discount.